This month is a fantastic time to take a break from meat and dairy and experience the wonderful health benefits of a plant-based diet. To cleanse you do not need expensive juices, supplements or prepared shakes. All you need is a real food, high fiber, nutrient dense meal plan. 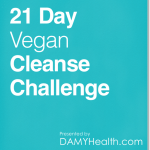 Our 21 Day Vegan Cleanse Challenge is everything you need to have a positive cleanse experience. After signing up not only will you receive the full raw/vegan cleanse challenge (read below for all that is included in this awesome package), you will also receive the 21 Day Vegan Recipe eBook. We have seen some amazing results from our community doing the 21 Day Vegan Cleanse including members shedding 10 lbs easily, improved digestion, clearer skin, better sleeps and increased energy levels. Now you can create these results for yourself. ***Remember: For all DAMY Lean, Bikini Body Program and DAMY Method Program members this is a free resource. You do not have to purchase this. First Oprah, then Beyonce, now YOU! 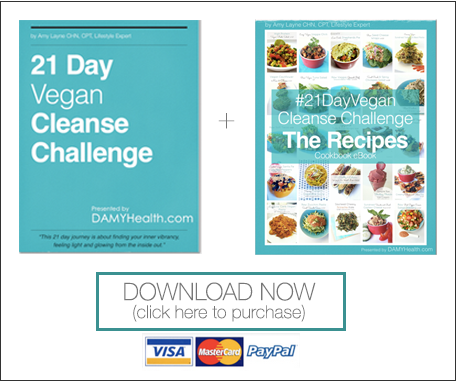 Welcome to The DAMY Health 21 Day Vegan Cleanse Challenge! 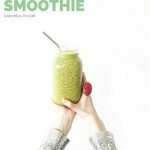 This is a high-raw, vegan eating challenge that comes with a full ebook containing an eating plan, recipes, guidelines, motivation as well as weekly emails. Why Do a Vegan Cleanse? Eating a high fruit and vegetable diet that are as close as possible to their true state in nature is the best way to fuel your body with nature’s energy. These foods are purely grown from the energy of the sun and the nourishment of the earth. 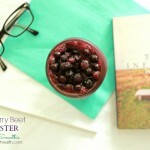 It is truly the most vibrant, naturally energizing way to eat. As humans we tend to fall into ruts or convenience but like everything in life it is healthy to stand back once in a while and take inventory of our lives. How we eat fuels our whole life. What we consume effects how we feel, how we think, our physical health, energy levels and emotions. When we get busy we turn away from foods that are more natural and seem to turn to convenience box foods. This is true for vegans and non-vegans alike. Many vegans fall into a processed foods, high carb, high sugar lifestyle. This 21 Day Vegan Cleanse is perfect non-vegans, vegans and vegetarians that are looking to eat a healthy nutrient dense vegan diet. 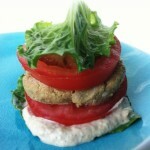 Who is the 21 Day Vegan Cleanse for? 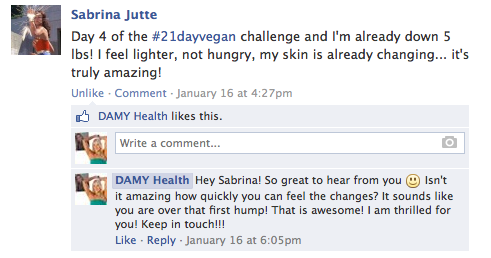 Why do the 21 Day Vegan Cleanse? 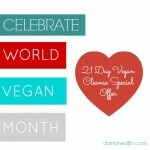 What is included in the 21 Day Vegan Cleanse? What should I expect with the 21 Day Vegan Cleanse? Expect to feel awesome mentally and physically. Not only are you doing something that makes your body feel great you’re also participating in a kind and gentle way of eating. This brings not only a physical benefit but it also brings a mental benefit knowing you are living in tune with your beliefs and the world. When you join let me know how you are doing via Facebook or Instagram. 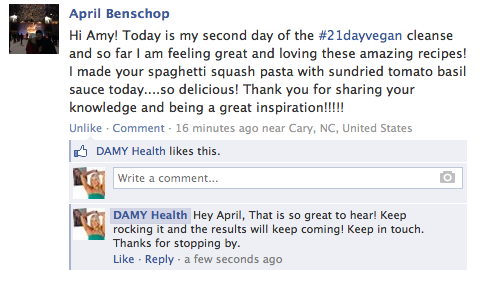 You can also use the hashtag #21dayvegan & #DAMYHealth so I can find you. To start your 21 Day Vegan Cleanse Challenge simply purchase your package below (you will receive download instructions after confirming your purchase). If you do not receive your download instructions within a few minutes of your purchase please check your junk, spam or promotions mail folder. If you find the email there make sure to mark us as safe in your inbox. *Exclusive DAMY Member Content: This wonderful ebook is free for all DAMY Health Online Program Members. You can find your copy on the DAMY Members Only Private Site.